EXCEPTIONALLY LOCATED, IMPECCABLY PRESENTED- SIMPLY THE BEST! If you only have time to view the very best, and you've earned the right to a prestigious lifestyle, if you desire privacy and elegant entertaining....then welcome to a majestic family home in the renowned Tuxedo Junction! * 5 enormous bedrooms comprising of: a large parent's retreat with a magnificent private lounge or den area, stylish ensuite complete with a spa bath, and huge walk in wardrobe. You will also find a secondary master suite that is equipped with a large ensuite, perfect for a teenage child or guest bedroom. Two of the three remaining bedrooms host large walk in wardrobes while the other has wall to wall mirrored robes. The main bathroom has floor to ceiling designer tiles, in spotless condition and has been designed with families in mind. * You'll find three separate living areas that consists of a central lounge area that links all your bedrooms. This extensive room makes the ideal children's lounge, with tiled floors and enough room for the Xbox and toddlers play area. This space also flows out to the outdoor living areas. The informal dining room adjoins the huge chefs kitchen and offers a convenient area to host intimate family dinners and features large windows flooding the room with natural light. The second family room offers yet another area for the parent to unwind and has been artfully positioned within the home looking out over the rear yard and pool area. * The kitchen is a recipe for success and one of the biggest I have ever seen! With sprawling granite bench tops, a well-appointed island that serves as a workspace and snack bar, a free standing gas stove and views from every angle. The budding or experienced chef will come home to prepare meals quickly and efficiently. * The home is a steel frame construction and was built in 2004. You will find design features such as high 2.7 meter ceilings throughout, double timber front doors, security screens, tinted windows, a cozy fire place, air conditioning, insulation, bio-cycle septic system, two big water tanks, spotless and modern fixtures and fittings, abundance of storage including a beautiful dream laundry and double lock up remote garage with additional storage, free flowing floor plan and much much more! 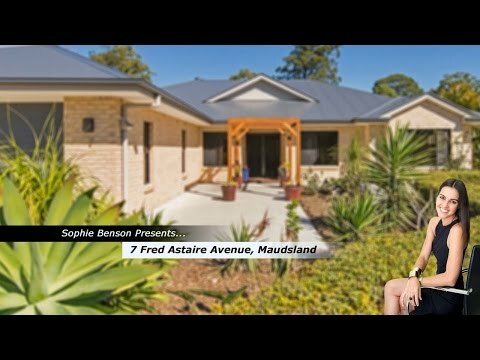 * The north facing vast outdoor alfresco area is top quality with a pitched high roof-line for you to enjoy uninterrupted bushland surrounds. This area will captivate every guest and effortlessly host numerous summer pool parties. * The men will find just over one acre of flat usable land and the best side access anyone could hope for. An attractive timber fence will give you entry to the rear yard and abundance of graveled parking, work area or if you run a home business this property has been purposely built to cater for a million different uses. The 14x7 meter shed has three phase power, three roller doors, huge carports and the sellers are happy to leave an additional shipping container for the new owners. Additionally, the block is positioned adjacent to a picturesque duck pond and backs onto a leafy meandering dry creek bed offering a quiet and private setting to raise the family. The low maintenance landscaping will be a joy to care for and the fully fenced secure yards mean your furry friends will be as happy as you! * Tuxedo Junction is located only 10 minutes from the M1 motorway and offers a convenient place for families to escape from the stresses of work and suburban living. The Estate was designed to cater to large families that appreciate space, seclusion, tranquility and large rolling lifestyle blocks that offer a low maintenance alternative to acreage living. Tuxedo Junction embodies the elegance of lifestyle living! You will find multiple parks and an appropriately positioned Day Care within the Estate. This home is what dreams are made of and I will be delighted to show you much more...so please view the digital inspection now or give me a call to see for yourself the endless features this family home has to offer.